Use our EASY ORDER FORM to have our delicious holiday selections delivered to your door, or have them shipped directly to friends and family. Through the years I have grown particularly fond of some of my grandmother's recipes and a few of my own creations. This assortment is an ensemble of traditional European style chocolates with American influences lovingly made with only the finest ingredients. I hope you will enjoy them as much as I do. This assortment includes: Cleo, Chambord Truffle, Haystack, Turtle, Harvest Truffle, Butter Pecan, Cappuchino Truffle, Almond cluster, Lemon Truffle, Crocant, and Peanut Butter Addiction. 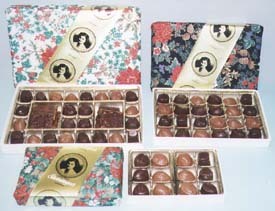 A medley of chocolates from both the Old World Selection and The Gasbrecht Selection. An exquisite collection of our finest chocolates. This assortment includes Chambord Truffles, Grand Marnier Truffles, Hazelnut Gianduja, Praline & Orange, Raspberry Marzipan Truffle, Praline & Marzipan, Marzipan & Orange, Praline & Minced Toffee and Crocant*. * Crocant available only in the one pound box. The Gasbrecht Selection is named for and dedicated to, my mentor, in appreciation for all the coaching and sharing I've received through the years. The selection is all dark chocolate. Packed 4 to a ballotin gift box. This sampler will make any nut lover happy. They will receive a one pound box of mixed dark and light chocolate almond bark and a half pound box of butter crunch. Made with fine rich chocolate and plentiful fresh roasted almonds, gift boxed. 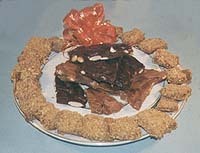 Yummy buttery toffee drenched in milk chocolate and then rolled in roasted, minced almonds. 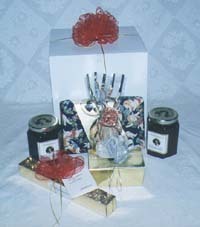 Packaged in a shining gold ballotin and tied with a festive bow. Hot chocolate always gets rave reviews in our shop. 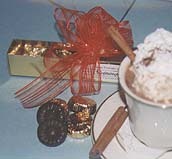 Now you can make the same rich hot chocolate at home. Just add two or more daises to a cup of warm milk or half and half, stir till chocolate melts and you have rich hot chocolate. You can also make dessert coffee by adding a daisy or two to your coffee, stir with a cinnamon stick and top with whipped cream for a very special treat! Superb desserts at a moment's notice. This kit contains two 10 oz. 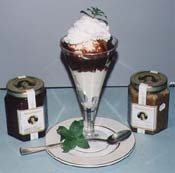 jars of chewy hot Fudge Sauce. Spoon over ice cream or pound cake to make a perfect last course. Steininger's rich creamy milk chocolate pops, an ideal gift for all ages.